Confessa apertamente Martin Davidson che tra i motivi che lo portarono a fondare l'etichetta Emanem, nel lontano 1974, c'era il desiderio di documentare - per quanto possano fare le registrazioni audio di concerti di musica improvvisata - le straordinarie gesta della scena londinese dell'epoca. E tra i suoi campioni c'era soprattutto Paul Rutherford, al quale negli anni avrebbe offerto più e più volte spazio con pubblicazioni di grande rilievo, a partire dall'indimenticabile The Gentle Harm Of The Bourgeoisie (1976). Oggi torna a rendere omaggio al compianto trombonista con un nuovo album che raccoglie estratti da vari concerti tra il 1979 e il 2007 in solo, in duo con Paul Rogers o in trio con Veryan Weston e Marcio Mattos: In Backward Times. We founded Emanem in 1974, mainly because we kept going to improvisation gigs in London and hearing music that was superb, unique and original. And it was not being recorded for further dissemination – it was just there once for the few people who were the audience. Paul Rutherford solo performances were perhaps the most outstanding music that was just (to quote Eric Dolphy) 'gone in the air'. His excellent trio, Iskra 1903, with Derek Bailey and Barry Guy, had been documented on Incus (reissued as Chapter One on Emanem 5311), so I started recording his solo pieces and issued his selection of them as The Gentle Harm Of The Bourgeoisie (reissued on Emanem 4019). 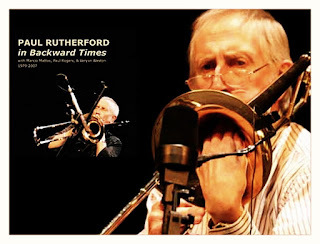 I felt at the time that he was the greatest trombonist in free improvisation, thanks to his strong, imaginative lines involving a considerable range of sounds, made with just the instrument enhanced with some use of his voice and mutes. His quiet but outrageous sense of humour and somewhat outlandish use of form also helped. After forty years of further listening to a wide range of improvisers, I still feel the same way. I consider that he was one of the best trombonists in any genre, as well as one of the finest improvisers on any instrument. Once issued, The Gentle Harm became very influential – not just with trombonists. Going through my archives recently, I came across the four concert items that make up this cd, and they seemed to be crying out to be released as they are some of the best music I have heard in ages. So I make no apologies for issuing yet another collection of his music.